This post is a follow on to the video on Systems Architecture here (video). 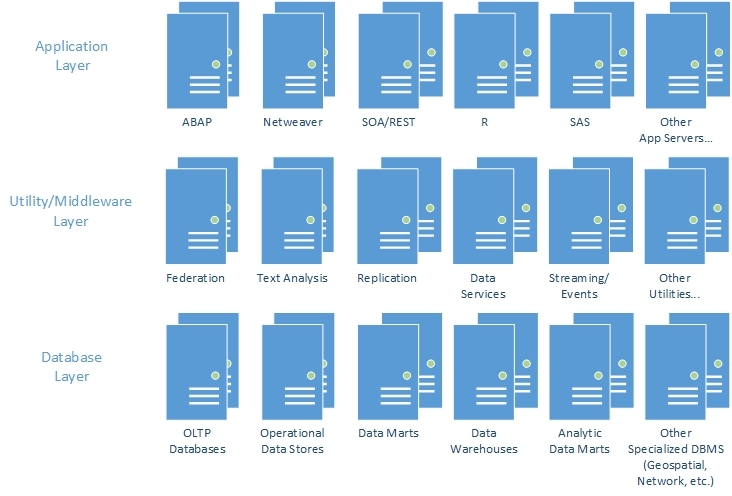 I’ll describe how HANA, the Platform not the Database, is cutting fat from the landscape. If you have not seen the video recently it will be worth a quick look as I will only briefly recap it here. The video, kindly sponsored by Intel, suggests that the distributed architecture we developed to collect lots of very small microprocessors into a single platform in order to solve big enterprise sized problems is evolving as multi-core microprocessors become ever more capable. In my opinion, we are starting to collapse the distributed architecture into something different. 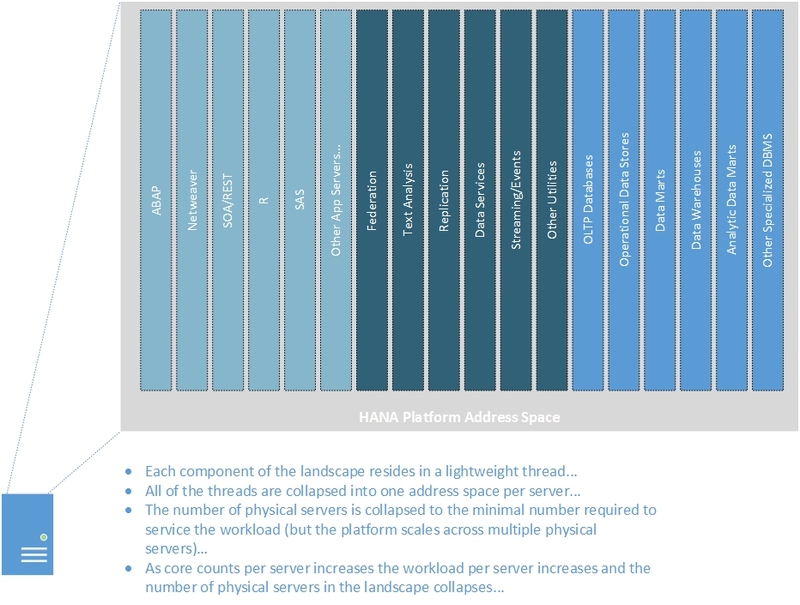 Figure 1 shows how we might deploy a series of servers to implement an SAP software landscape. Note that if we removed a couple of pieces the picture represents a platform for just about any enterprise solution. In other words, it is not just about SAP ERP solutions. I have left this in so that companies with SAP in place can see where they may be headed. Figure 2 shows the same landscape deployed in the HANA Platform. It is a very lean deployment with all of the fat of inter-operating systems combination replaced by processes communicating over lightweight thread boundaries. Squeezing the fat out will provide significant performance benefits over the distributed deployment… it will be 2-5 times faster easily… and 2-3 times faster even if you deployed the landscape on a single server in a series of virtual machines as you have to add in the overhead of a VM plus the cost of communication over virtual networks. The HANA Platform is very powerful stuff… and if you had the choice between SAP and a competitor, the ability to match the performance on 1/2 the hardware might provide an overwhelming advantage to HANA.Note that in this evaluation I have not included any advantages from the performance kick due to the HANA Database… so the SAP story is better still. Those of you who heard me describe HANA while I was at SAP know that this is not a new story. It was to be the opening of the shelved book on HANA. So this post satisfies my longstanding promise to get this story documented even though the book never generated much executive enthusiasm. The trend in systems architecture outlined in the video is being capitalized by SAP as the HANA Platform… and the advantage provided is significant. You should expect SAP customers to rapidly move to HANA to take advantage of this tight, high-performance landscape.